All photographers will tell you that speed is king, particularly when storing their work. With over 500 successful designs, SanDisk has updated their Extreme series to introduce the SanDisk Extreme 510 Portable SSD, which is a better choice for photographers. The device can withstand more physical abuse than most products in the market. Even though the product is not suitable for individuals in need of larger storage capacity for archival purposes, it offers 480GB as the storage space. Due to its improved transfer speeds, the product will appeal to both videographers and photographers regardless of their stripes. The speed is more than enough in most on-location professional shoots. Unlike hard disks, SSDs had a slower start. However, they are now becoming more popular among individuals in need of portable devices due to their durability. The devices are shock resistant, can withstand extreme temperatures than the HDD competitors. Due to its updated rugged design, the Extreme 510 Portable SSD is splash and dust resistant. Everyone will agree that damaging a HDD with untimed strike or shock is easy. Therefore use of HDDs in portable devices is a bad idea. If you would like to make a better storage investment that is also portable, you should consider the SanDisk Extreme 510 Portable SSD. And if you are more inclined to the aesthetic side, you are likely to appreciate the wonderful style of this product. The manufacturer crammed it into smart black chassis and it will therefore fit into your pockets easily. To a considerable degree, the product is smaller than your tablet or smartphone. If you are among the individuals who move a lot, the metal lug and rubber coating will help you clip the device to your bag or strap it without any worries. It provides 128-bit encryption through the SanDisk Secure Access. To buy this wonderful device, which comes with 2 years warranty, you will need $249.99. SanDisk has been producing small and sleek products. SanDisk Extreme 510 is not an exception. However, due to the increased 480GB capacity, the device might look bulky to most individuals. On the top side, the device features SanDisk’s bright-red branding that you might be already accustomed to. The first thing you are likely to identify on the sides is the metal lug and the red rubber bumper for protection purposes. On the bottom, you will find some information about the brand. There is splash and dust-resistant rubber door protecting the USB 3.0 port near the metal lug. Even though some people claim that the device is ineffective when connected to a desktop , you can push the door into smaller recesses to help protect the opening. Most people will not consider performance when shopping for the best SSD. However, with the SanDisk Extreme 510 Portable SSD you do not have to worry. Its performance is extremely satisfactory compared to most other competitors. With its 3.0 interface, transfer of files is extremely fast and will meet your expectations, especially if you are in videography or photography fields. The manufacturer has designed the product for storing lump data. It’s water resistant and durability features have also made it a perfect option for use in trekking and photo shoots. Most importantly, its features replicate thumb drives with diamond-like shape. At the same time, the product can store 480GB of data. Actually, SSDs are more expensive compared to the traditional hard disks. That has not affected their popularity. Most online retailers also charge an additional shipping cost for every product along with delivery charges. Including the import charges, you will need around $178 to get the product. The manufacturer offers a 3 year warranty on the product and therefore you should not worry about losing your money. Most of the customers who purchase the product are those who store larger amounts of data. The device is faster and reliable. SanDisk Extreme 510 runs with power from USB ports and therefore you will not need an external power source. What’s more, the product has no heating issues including when used for longer periods. It is an all-terrain device that can withstand rains, dust and splashes common in outdoor adventures. In addition to its dust resistant and waterproofing feature, the device has cushions to protect it from damages. SanDisk Extreme 510 offers encryption and privacy facilities. Therefore, you do not have to worry about the security of your most important files. Nevertheless, the feature is on the advanced level. To access all the advanced features, you should install the software that comes with the product on your MAC or Windows PC. The software is easier to use. The drive is superfast for copying personal files between disconnected networks. It has a smaller capacity compared to most other solid state drives in the same category. You will enjoy faster data transfer speeds. It has a lower write/read speed compared with some other devices of the same class. Solid State Drives (SSDs) have been around for many years, with the original ones being confined to research and military use. 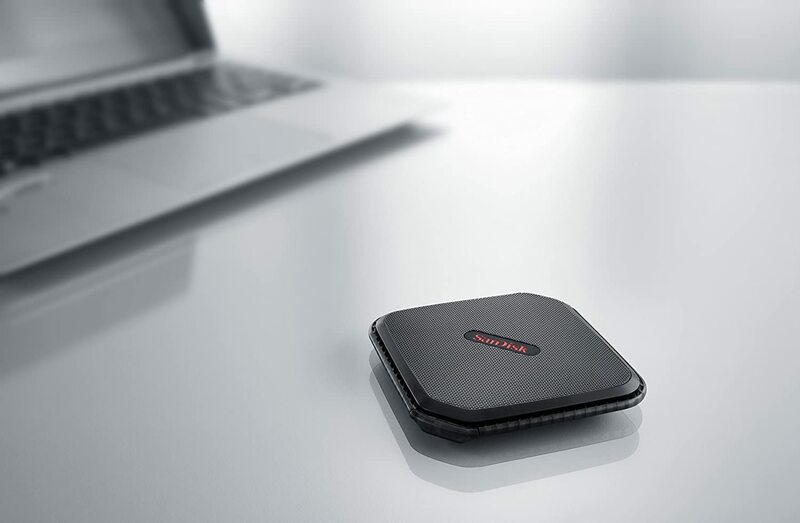 The diamond shaped SanDisk Extreme 510 Portable SSD is fast and small. It boasts a USB 3.0 interface and provides sequential read/write speeds of around 415MB/s and 340MB/s respectively for the 120GB and the 240GB variants and 430MB/s and 400MB/s respectively for the 480GB variant. The device also boasts all-terrain durability. And because it is IP55 certified, it is dust and water resistant and can stand up to the general trek hazards including splashes, rain and spills. The manufacturer has geared the product towards photographers, creative professionals and videographers who are always on the go to capture more scenes from the wild or nature.